Vanilla Pudding Recipe... from scratch! | Simple. Tasty. Good. Vanilla Pudding Recipe… from scratch! Do you know your cooking basics then? Ever made a vanilla pudding recipe from scratch? Don’t let me hear you say that Jell-O is easier. It is not! Well, maybe. But it will cost you tremendously on flavor and texture. Homemade in this case is definitely better! Look at the ingredients you need. Shouldn’t be that much of a problem! Believe me, try the recipe below and you’ll never make that instant box blubber again. No-box and no regrets. Also try my chocolate pudding recipe from scratch! 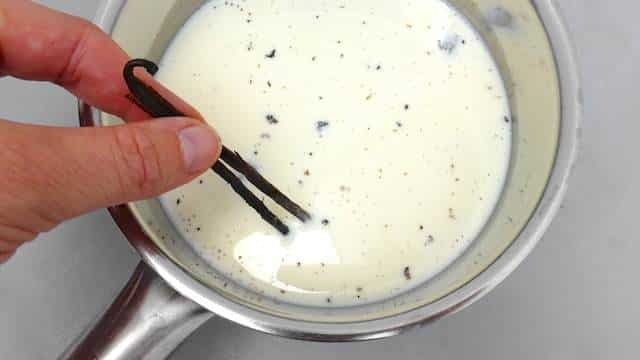 I am using a vanilla bean for my recipe, that’s why I have to add it to warm milk in order to make the vanilla infuse and release as much flavor as possible. If you are not using a vanilla bean but a drop of vanilla extract: just combine all the (cold) ingredients in a large saucepan, mix well and then let the milk thicken over medium heat for 8 to 10 minutes until you get a pudding consistency. 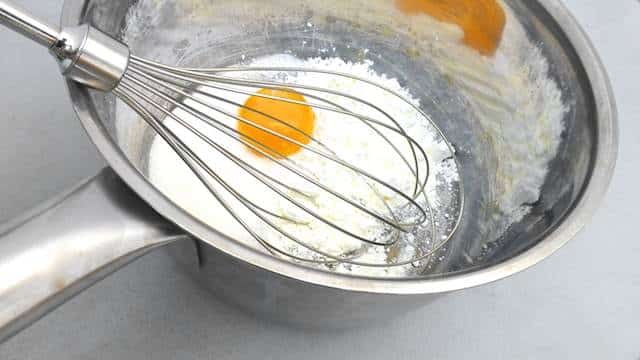 Whatever you do: whisk constantly! Or the starch, sugar and egg yolk will sink to the bottom of the saucepan, become sticky and burn while the milk isn’t thickening at all. Slice the vanilla bean lengthwise and then scrape your knife along the soft inside to remove the black vanilla seeds. Pour the milk in a large saucepan. Add the vanilla seeds and the split vanilla bean together with a little pinch of salt. Place the milk over medium heat and bring it to a gentle boil for 3 minutes. Then take the pan off the heat and let the milk cool down a little for 5 minutes while the vanilla releases its flavor. In another saucepan add an egg yolk, sugar and cornstarch. Stir well. 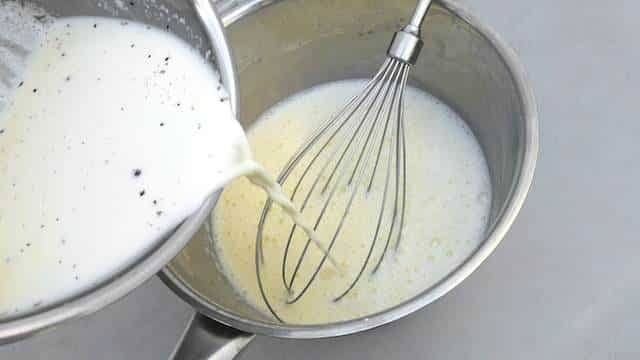 Remove the cooked vanilla bean from the milk and then pour a little of the milk on the egg yolk mixture. Stir well. 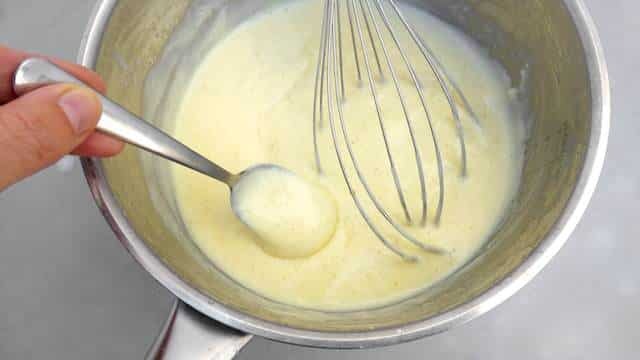 Place the pan over medium heat and add the rest of the sugary vanilla milk to the yolk mixture. 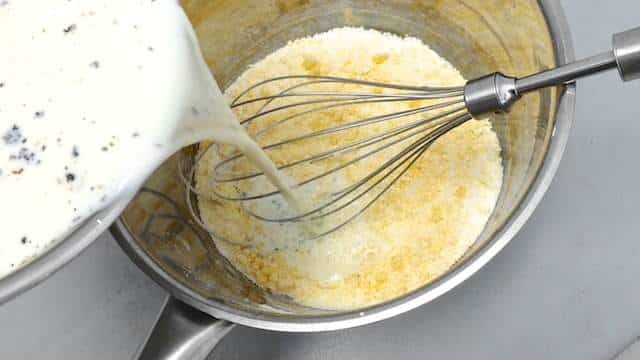 Keep whisking the milk or the starch, sugar and egg yolk will sink to the bottom of the saucepan, become sticky and burn. The pudding will start to thicken after 6 to 7 minutes. Once it becomes glossy and thicker, stir in the remaining egg yolk. Then turn the heat lower and let the pudding simmer for another 3 to 4 minutes. Keep stirring. In the end take the pan off the heat and pour the hot vanilla pudding into separate ramekins or in a large bowl. (You can pour the pudding through a fine sieve to remove any lumps or bits of vanilla bean if you like.) Cover the pudding with cling film to make sure that there’s no think skin on top once it starts to cool. Serve the pudding lukewarm or cold.